Palm Tree Removal Adelaide | Sturt Stump Cutters are the Best in SA! Our team are dedicated to providing Adelaide locals with the most dependable arborist service available. We approach every job with integrity and consideration for the safety of those around us. Over time, we have refined our services to come up with the most simple and effective ways of managing your concerns. We have excellent communication skills and always take your preferences into account before going forth with a job. For example: if you have a dangerous old tree lurking but you don’t want to rid of it completely—we’ll present an alternate solution. For the most reliable team in palm tree removal Adelaide, give Sturt Stump Cutters a call on 0418823733 today! While you pay for labour, our advice is free! And every piece of it comes from a genuine place. There’s more to palm tree removal Adelaide than you might think. Generally, we begin by undertaking a full assessment of your tree and producing a detailed report. The results tell us what risk your tree poses, how healthy it is, and what preservation or management systems need to be implemented. This information is vital for people who want to restore the condition of their tree, as opposed to removing it. We can address pest infestations, tree disease, and reduce the risk of fire hazard. We use only the safest methods and techniques to meet Australian standards, and are always on stand by in the event of emergency or storm damage. Don’t take risks, choose a team you can trust! Stick with Sturt Stump Cutters for palm tree removal Adelaide. Russell Ellis has been taking care of palm tree removal Adelaide for over 30 years. Through experience, he’s gained an in-depth understanding of how to manage and treat sick trees. If you’re not sure how to determine if your tree is ill, there is one main key indicator. Discoloured or wilting palms are definitely indications that your palm tree is dying. It’s quite common for the fronds to die off and regrow over time, but be sure to check the crown. The crown is the top and centre section of your tree, and it will indicate stress by reducing to a brown colour. The stress could be caused by poor fertilization, lack of water, or pest infestation. Our arborist team at Sturt Stump Cutters have solutions for all of these issues. If you want to avoid palm tree removal Adelaide, give us a call and we’ll undertake a full assessment! 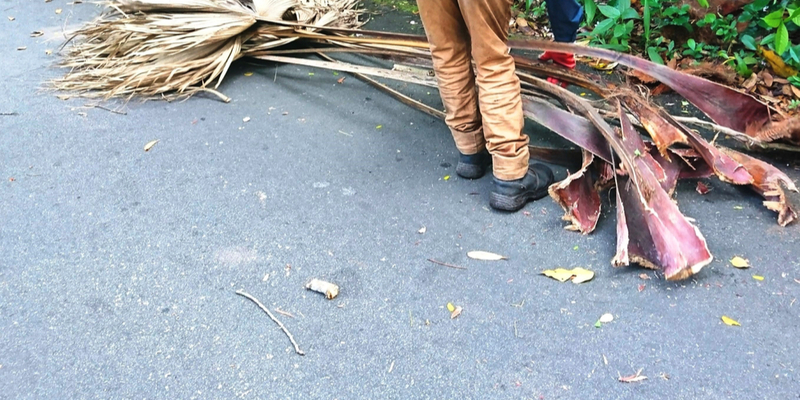 If you’re interested in palm tree removal Adelaide, give us a call on 0418 823 733. We offer the full-scope of tree services to help you regain control of your yard! No job is too big or too small for our talented team.